Home Edition 01/2018 Uwe Krüger: Mainstream. Why we no longer trust the media. There is a problem with journalism in Germany – this forms the starting point of the latest work by Leipzig-based journalism expert Uwe Krüger. In it, he examines the question of why people have increasingly lost trust in and become more critical of the media in recent years – a phenomenon seen not only among those who complain loudly about the “Lügenpresse” [liar press], but across the political spectrum. Following his 2013 dissertation that examined and denounced the influence of elite networks on the alpha journalists in Germany, Krüger’s new book “Mainstream. 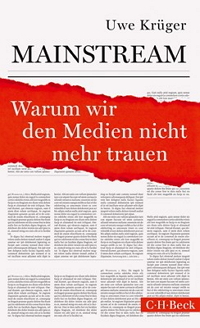 Warum wir den Medien nicht mehr trauen” (2016) focuses on the question of how and, above all, why the range of opinions represented in the German media appears to have decreased. However, the author does not investigate whether the variety really has shrunk. Instead, Krüger quotes a study from the 1990s and uses reporting on selected events – predominantly the Ukraine crisis, which he sees as the point around which mistrust in the media crystallised – to illustrate the finding that the media of record largely share the same choice of topics and assessment thereof. He also refers to various opinion polls that have repeatedly demonstrated the falling level of trust the public places in the media and especially in their lack of bias. Starting from the observation that journalism is suffering from an existential crisis of credibility, Krüger goes in search of the causes of this “synchronisation” (p. 7) of the media of record. He finds them at various levels, with the influence of the elite networks appearing as a topic once again. In addition, Krüger believes that the phenomenon of media mainstreaming in reporting (cf. p. 27) is motivated both by the increasingly precarious production conditions in journalism and by the origins and professional socialisation of journalists, who are increasingly drawn from a specific socio-cultural and economic background (“liberal intellectual”, p. 79) and thus represent certain opinions and networks. This brings Krüger to the alarming conclusion that the media and journalists are gradually chipping away at their own basis for existence, as they are becoming increasingly alienated from their audience and are thus unable to fulfil their core purpose of providing information and guidance for society. Krüger closes by suggesting how this development could be stopped (p. 140-144), making a plea to both journalists and the public in a chapter appropriately titled “Relaxation Exercises”. Firstly, he states, journalists need to do more to address the ambivalence caused by their close relationship with decision makers in business and politics – however useful this link may be. Krüger also appeals to journalists to find long term ways to deal with the consequences for their profession of the changes to the world of public communication brought about by social media. This also means clearly facing up to dialogue with the public and placing more trust in the audience. 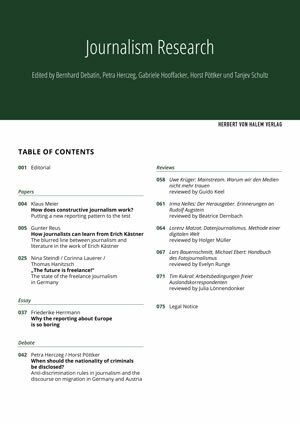 Secondly, Krüger demands that the public demonstrate greater interest in and understanding of the production conditions to which journalism today is subject and of the environment in which it struggles to be heard. The topics covered in Mainstream do not stray far from those in the author’s dissertation. However, this latest work is presented as a very different type of book. Mainstream is a grippingly-written essay on a development in journalism and is not primarily aimed at experts in academia, but will surely be easily comprehensible and enlightening to the interested layperson. Despite this, the 38-year-old author frequently refers to academic findings that give the book relevance and transform it into more than merely a personal opinion piece. The unpretentious way in which literature, research and even concrete examples from the media are woven into the text, serves to make his arguments more credible and persuasive, without disturbing the flow. For example, he illustrates his thoughts with the way the Wulff affair [a scandal involving the then German President] and the TTIP trade agreement were reported, the failure of the international press in the run-up to the property and economic crisis in 2008, and the noticeably pro-American stance of leading German journalists. The successful way in which he navigates the tightrope between academic rigour and current affairs makes Krüger’s book more than just yet another repetition of prejudices and subjective opinions by an indignant contemporary. He thus makes a contribution to the ongoing discussion on the media in a form that is familiar from the English-speaking world, but that remains all too rare in German-speaking countries. In addition, the author succeeds in communicating a clear message without appearing to excessively simplify or moralise. Some of his arguments are certainly vehement. For example, he explicitly accuses German broadcasters ARD and ZDF of deliberately “clearly biased” (p. 119) reporting on the economic crisis in Greece and describes developments in Germany as a “regression” (p. 127) towards the kind of consensus journalism seen after the Second World War. However, he also demonstrates understanding of this kind of problematic development and remains constructive in his approach. In doing so, he highlights various dilemmas faced by journalists in their day-to-day work, such as whether to always provide the audience with all the information or instead to weigh up responsibly which information is helpful in understanding a situation and which is more likely to lead to false conclusions or over-interpretation. By moving away from the rigid and often inaccessible form usual in academic texts, Krüger also exposes himself to criticism. His view that the Russian perspective was deliberately neglected during the Ukraine crisis, or that those responsible for the financial disaster in Greece received excessively negative press in Germany, will not be to everyone’s taste. Some contradictions also emerge. For example, he writes that journalists increasingly see their role as that of conformist communicators of information who make no attempt to critique or monitor (p. 39), only to later criticise them for taking too great a responsibility upon themselves for dividing the world into good and evil (p. 105f). The author must, however, be given credit for having the courage to come down from his ivory tower and address these attacks, which nevertheless do nothing to dilute the urgency of his key arguments. This review is based on the first edition of the book published in March 2016. A revised and updated version appeared in August. This review first appeared in rkm:journal. Dr. Guido Keel is a lecturer at Zurich University of Applied Sciences’ Institute for Applied Media Studies. The focuses of his research include quality in journalism; change in journalism; and journalism in non-European contexts. Uwe Krüger: Mainstream. Warum wir den Medien nicht mehr trauen. Munich [C.H. Beck] 2016. 170 pages, EUR 14.95. When should the nationality of criminals be disclosed?